Welcome to Palestine Today, a service of the International Middle East Media Center, www.imemc.org, for Tuesday, August, 22, 2017. Settlers and troops attack worshipers in Jerusalem and invade West Bank communities. These stories, and more, coming up, stay tuned. On Tuesday, Israeli police stationed at the gates leading to Al-Aqsa Mosque compound, in Jerusalem’s Old City, prevented the entry of textbooks destined for three Palestinian schools located inside the Muslim holy compound. The books were going to two high schools and a kindergarten. The police prevented the entry of the books because they bore the logo of the Palestinian Authority. Later in the day, 102 settlers stormed the courtyard of Al-Aqsa Mosque on Tuesday morning, via the Moroccan Gate, with intensive presence of Israeli police. Staying in Jerusalem, Israeli soldiers abducted, on Tuesday evening, a Palestinian father and his teenage daughter, in Silwan town, in addition to abducting several workers in Sheikh Jarrah and breaking into stores in the Old City, in occupied East Jerusalem. The abductions took place after the soldiers invaded the neighborhoods of East Jerusalem and clashed with many youngsters, who hurled stones and empty bottles at their vehicles. Israeli soldiers invaded, on Tuesday evening, the town of al-’Ezariyya, southeast of occupied East Jerusalem, attacked a family of a detainee, and caused many Palestinians to suffer the severe effects of teargas inhalation during ensuing clashes. The soldiers also invaded a home in Hebron city, and a mosque in Yatta nearby town. 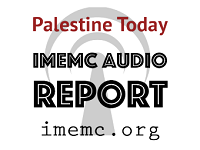 And that’s all for today from the IMEMC News; this was the Tuesday, August, 22, 2017, news round-up from the Occupied Palestinian Territories. From more news and updates, please visit our website at www.imemc.org today’s report has been brought to you by George Rishmawi and me Ghassan Bannoura.